Newspapers first appeared in Europe in the mid-17th century. They evolved gradually from a similar type of publication called a broadsheet—a single sheet of paper that responded to unusual events. Although newspapers today and those in the past resemble one another in many ways, newspapers and their content have changed dramatically over time. Newspapers in different societies are often quite different from those you may be familiar with. Thus, it is important to read newspapers from different times (and places) carefully. 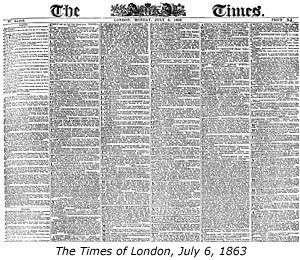 For example, this is the front page of the Times of London, one of the most complete and accurate newspapers in the world in the mid-1800s, on the morning after the Battle of Gettysburg, a major historical event. Someone reading this paper in the 21st century might be surprised to find nothing about the battle, but the timely and broad coverage we now expect was not always available. Technological innovation made the modern newspaper possible. Before the late 19th century, paper was often made from textile fibers like cotton and linen, frequently taken from recycled rags. Only after the invention of paper made from wood pulp did low-cost, low-quality paper become readily available. The rise of the paper industry made paper cheap, which meant that newspapers could be printed for reasonable prices. Industrialization and new global markets, especially in raw materials, helped to increase production leading to inexpensive, mass-produced paper. 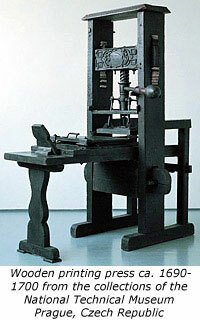 Changes in print technology influenced newspaper production as well. Print began with individual metal letters placed by hand in special grids. The letters were inked and then paper was pressed on one sheet at a time. Technological innovations steadily decreased the amount of effort and increased the speed at which words could be printed onto paper. In the 19th and 20th centuries, it also became easier and cheaper to move information across long distances, which had a huge impact on the newspaper business. Railroads and steamships made long-distance travel easier and faster beginning in the early 19th century, so reporters could travel to interesting events. With the invention of the telegraph in the mid-19th century, traveling correspondents could report back to newspapers regularly and rapidly. Images, too, could be sent over the wires, and as photographic technology improved in the second half of the 19th century, news photos became a reality. As words and pictures moved ever more quickly around the world in the 20th century, newspapers began to rely on wire services like Reuters and Agence-France Presse. These services had reporters and photographers based all over the world, and they enabled newspapers that could not hire foreign correspondents to cover distant events quickly and in detail. The rise of the wire services also caused increasing similarities in the content of newspapers from different places. Beginning with World War II, reports of nonlocal events were similar in newspapers from the Philippines to Nova Scotia. Newspaper readers sometimes recognize this phenomenon immediately from the bylines—the line at the beginning of the story bearing the author’s name—of newspaper stories. If a story is attributed to UPI (United Press International) or a similar organization, rather than an individual reporter, it comes from a wire service and is often reprinted in hundreds of different newspapers. Syndication through wire services also led to the advent of features—comic strips, advice columns, editorial cartoons, opinion columns, and even weather reports and movie reviews—shared among many newspapers. As the price of paper and printing dropped, and as access to information from faraway places became faster and easier, newspapers grew larger and appeared more frequently. They changed from occasional broadsheets to regularly issued almanacs to daily papers to papers with several editions per day. In the past decade, the advent of the Internet as a mass communications medium also has helped speed up the news cycle: some stories now appear on newspaper websites in multiple editions, written and rewritten over the course of the day. This can create confusion when archiving or citing newspaper stories for those researching recent history.